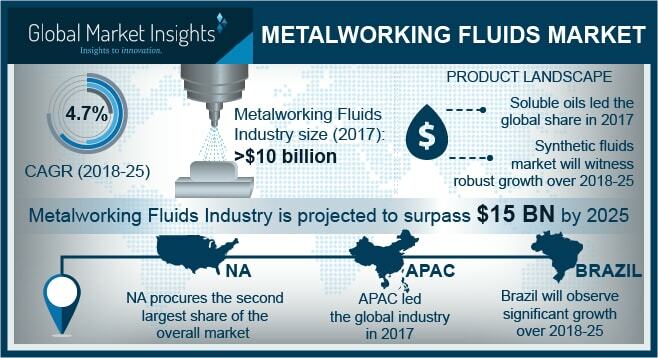 Metalworking Fluids Market size is forecast to exceed USD 15 billion by 2025; according to a new research report by Global Market Insights, Inc.
Metalworking fluids (MWF) market will be primarily driven by growing demand from automobile industry, which is exponentially growing over past few years. Disruptive technology and consistent advancements in process improvement and component modifications have positively influenced traditional automobile sector across the globe. Another prime growth driver for MWF market will be general manufacturing industry, which has witnessed some excellent growth numbers in specifically Asia Pacific and Latin America over the last decade. Digitalization of automobiles and growing prominence of electric vehicles pose a threat to MWF demand in the future. Moreover, the increasing usage of non-ferrous metal alloys, for example, titanium and aluminum in aerospace industry would hamper the product demand in the coming years as these metal alloys don’t need metalworking fluids during machining process. Petroleum-based MWF after usage are non-biodegradable and pose fatal health risks to workers operating in the surrounding for a long time. Health problems associated with MWF application are asthma, chronic bronchitis, allergies and skin diseases which are mainly due to inhalation exposure to liquid aerosols from the process fluids. Synthetic fluids shall be the fastest growing segment in the overall metalworking fluids market during the forecast timeframe. Aerospace industry is increasingly accepting synthetic fluids for manufacturing processes as these have non-flammability at higher temperatures coupled with superior resistance to rust and corrosion. Synthetic fluids are a good substitute to petroleum-based oils as they are water-based concentrates with excellent cooling performance. Removal fluids processed in metal removing is likely to be one of the lucrative application segments in the metalworking fluids market over the forecast timeframe. Forming fluids shall be the second most prominent application segment in the industry due to the growth in automotive and steel industries in the coming years. Asia Pacific accounted for a major chunk of global metalworking fluids market in 2017 and shall continue to remain in same position by 2025. Increasing product manufacturers focus in setting up production facilities in Asian countries including China and India on account of low initial investment and minimum labor charges, has resulted in reduced product prices. Also, subsidies for specific industries, tax breaks and export-oriented growth policies in countries including China, Japan, Indonesia, Bangladesh, India, etc., has grabbed attention of multi-national across the globe. Additionally, the regional market is comparatively irregulated, which shall be eventually fueling metalworking fluids demand across the region in the coming years. The metalworking fluids market is diverse and includes giant multi-national players to medium scale companies as well. The MWF industry has some chief global players including Total, Lubrizol Corporation, The Dow Chemical Company, Apar Industries Limited, ExxonMobil, Castrol Limited, Henkel, PPG Industries, Royal Dutch Shell PLC and Sinopec. Acquisitions and joint ventures are major strategies adopted by players operating in this industry. For instance, in 2014, FUCHS acquired Batoyle Freedom Group, Lubritene and Lubrasa. These acquisitions helped the company to meet the increasing global demand by increasing its production capacity. Most of the companies have their own sales and service networks in various regions for their products. Also, some of the producers operate their business through online orders. For instance, Milacron had recently launched its “ESTORE” to serve its customers online in Europe and North America.